The Golden Rule, “You shall love your neighbor as yourself” is embossed in “dough” in English, Hebrew and Arabic. The Torah is the Jewish book of laws and Rabbi Hillel, the elder, once said of the Golden Rule, ”This is the law: all the rest is commentary.” Grossman uses dough to represent the common “staff of life” that sustains us all. 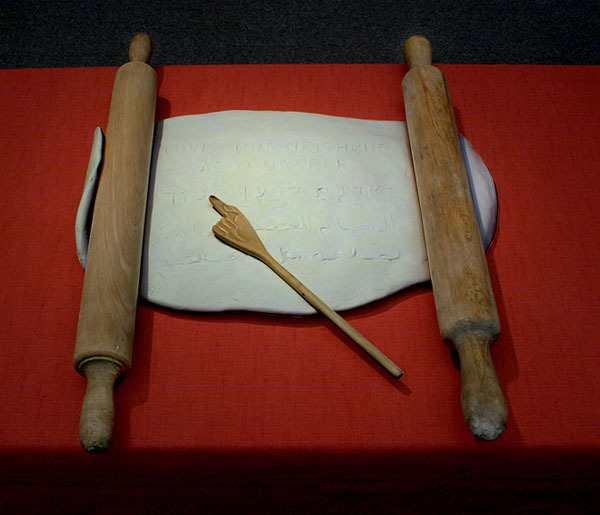 The rolling pins for making bread stand for the Torah scrolls and our work in progress to create a world in which we all can live in peace.